For many years strong, stable relations with the customers were the formula for success of the wholesale distributors. Nowadays, when rapidly developing digital technologies have taken over the world, the client expectations are constantly growing. A customer wishes for something bigger than free delivery or a flexible discount system. The wholesalers are forced to come up with the innovative approaches to business management and new wholesale solutions; otherwise, they will be left behind. If you are in the wholesale trade, you should be set for the changes caused by digitalization and embrace new opportunities offered by e-Commerce world. SAP Hybris portfolio will help you to keep up with the times. It provides full integration with the business processes as well as simplified integration between frontend and backend operation. Business processes automation as a core part of the integration can save your time, resources, and costs. When your employees do not have to perform routine tasks, they are more productive. They do not waste their time on phone calls to the perspectives but improve inventory management or order processing or find new suppliers. With SAP Hybris B2B companies can store all specific data on pricing, open orders, and other sales information in one place. Sometimes it is really hard to define customer segmentation correctly and make the right business proposition to the right audience. That’s ok. SAP wholesale distribution products are designed to meet these challenges. Using them, you can satisfy your customers across all their touch points starting from the first visit to the business website to a commerce interaction. The synergy of segmentation with omnichannel experience delivered by SAP Hybris ensures flawless customer journey. Take the example of a returning customer. He visits your site on SAP Hybris, chooses the required products and preferred payment option. Knowing that invoice payments are crucial for B2B companies, SAP developed a SAP Hybris Billing solution in order to automate billing and invoicing processes. The next step is adding goods to the cart. Analyzing the customer’s payment history, the system calculates the price automatically. The customer places an order online. When it comes to the shipping, the client has two options. The goods can be shipped either after processing the payment or just before. In the second case, the deferment of payment and penal sanctions after the past due payment can vary. SAP Hybris substantially simplifies the purchasing process, makes it more familiar for your B2B customer. 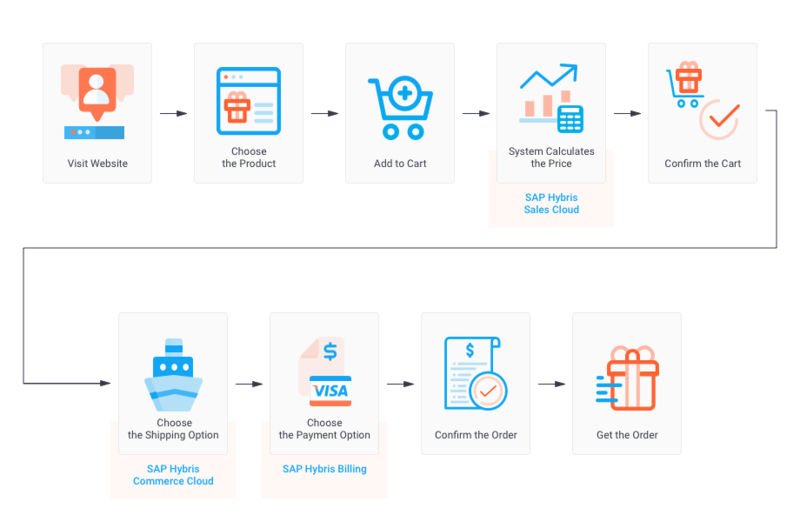 Its advanced features (SAP Hybris Billing, order management as a part of SAP Hybris Commerce Cloud, SAP Hybris Sales Cloud) are designed to avail your wholesale customers at each step of their journey. However, if your business processes are based on other SAP products by now, you can incorporate additional SAP solutions at extra charge. As you may see, thanks to SAP wholesale solutions, you can target clients where they make the most profit, discover things they care about. That makes every single interaction with a customer relevant and meaningful. Let us be honest, you hate it when your traditional platform cannot process a large amount of data within a certain period of time. You stand for implementation of a stable system that copes easily with this task. Besides, since you do business in the digital era, reliable integration of all business processes in the digital space is a must-have. Having studied your pain points, SAP combined the power of SAP Hybris set of tools with SAP S/4HANA business suite. SAP S/4HANA is a new generation corporate solution for enterprise resource management, developed on the basis of the advanced in-memory platform called SAP HANA. gives the ability to review current business processes and introduce new ones to remain commercially viable in a rapidly changing environment. Let’s say you use a traditional ERP system. When sales order issues occurred, your team has to work down numerous transactions and worklists to resolve it (e.g., incomplete orders, incomplete outbound deliveries). This process can be time-consuming. In its turn, sales order fulfillment cockpit gives your sales team instant access to the respective documents. The sales issues are defined and resolved much quicker. Thus, the tool raises the productivity of your team and the transparency of order management. The latest innovative technologies used in the SAP Hybris set of tools forever modified the interactions with the customers. All solutions are based on the integrated approach to business and allow experimenting, responding to market changes, and coming off with flying colors. There are four pillars of wholesale business: marketing, sales, commerce, and services. SAP Hybris proves to be useful to any of them. Marketing is a starting point that underpins the success of any business. Marketers tend to know everything about their customers to achieve their goals. Realizing the marketing challenges, the SAP team designed a specific solution called SAP Hybris Marketing Cloud. It helps to get all the required information about your clients and identify the right target audience for each marketing campaign. The analytical tools simplify the process of analyzing the past, predicting the future, and what is more important considering the present actions of the clients. You may follow the customer on his order history, purchased products, and their quantity. It will help your employees to perform warehousing duties, marketing, and sales activities better. Besides, knowing what customers had already bought, SAP Hybris Marketing Cloud can predict what repeat purchases customers may plan after a certain period of time. Thus, you can implement effective cross-selling and up-selling techniques with special incentives you prefer to offer for those who purchase in bulk (e.g., rewards, coupons) or industry firsts for improving customer experience like free delivery, one-click order, related product recommendations. work with multilingual sites, different currencies, brands, and taxation systems. The wholesale distribution companies should not ignore the downsides of the digital sales to survive in today’s highly volatile market. These are continually growing cost of acquiring new customers and retaining existing ones, the sharp decrease in productivity of sales team and high expectation of wholesale distributors concerning sales, service, and customer data. SAP Hybris Sales Cloud eliminates these obstacles. You may remember the situation when you last time had to set different prices for the same goods for different categories of customers. You took into account client’s history or order quantity while fixing the price. Therefore, you needed instant access to the data of all contacts. Account and contact management functionality available in SAP Hybris Sales Cloud gives such an opportunity. Your sales reps can select any customer and view all the information concerning order and payment history or transaction sales and after that make specialized commercial offers. It does not matter what channel of communication the customers use to contact your company whether it is a self-service that allows getting quick and straightforward answers without contacting customer support or contact center. They expect to receive in-depth assistance even before making a purchase. Comprehensive support regardless the communication channel chosen by the customer is achieved due to SAP Hybris Cloud for Customer. engage with the clients across all possible channels (emails, phone calls, social networks). Outstanding omnichannel experience with SAP Hybris Cloud for Customer swell the ranks of satisfied customers and helps to stand out from the crowd. the ability to define credit limit on the basis of different criteria, e.g., currency, order value, etс. So if you noticed that your competitors outperformed you, there is a good chance they have been using SAP Hybris Commerce Accelerator, and now all you have to do is to follow suit. With the solutions developed by SAP for distribution, the wholesalers take a chance to respond on the instant to constantly developing market conditions and changes in existing legislation. Focusing on General Data Protection Regulations which entered into force on 25 May 2018, SAP released version SAP Hybris 6.6 to respect the privacy of EU citizens. It is characterized by transparency and clarity when it comes to handling the customers’ personal data. The enhancements also affected SAP Hybris Product Content Management and SAP Hybris Customer Experience modules. Now you can edit your product content with the newest Microsoft import and export feature in Backoffice Product Content management. Well-known for its demand-driven approach and quick response to the boldest market calls, SAP didn’t stay on the sidelines about personalization issues. Personalized search profiles appeared in SAP Hybris 6.6 let optimize product searches and navigation increasing closed deals. The list is far from complete and it is in your power to extend it. Be brave to share your feature needs with your Hybris development partner, and who knows, maybe with the next update you will get what you want. As you may notice, when it comes to developing e-Commerce platform more and more companies opt for the out-of-the-box (OOTB) approach. That is not surprising since such products cost less than the custom developed ones. There are no issues with the updates of this sites. Besides, they are more reliable than those from scratch. Hybris developers spend more time on setting up the dashboard and choosing the themes on TemplateMonster than on developing itself. One of our old clients, an American industrial conglomerate of spare parts for control, protection, and distribution of electrical power chose SAP Hybris for creating a digital trade space oriented on B2B accounts. The major reason why the client gave preference to SAP Hybris was an out-of-the-box integration with Data Hub. This solution connected the operating SAP ERP system and the online store for wholesale trade under development. Besides, having a catalog that comprises over 12 millions of items, the client desperately needed a full-text search to reduce search time and to improve catalog management. The previous usage of Oracle system with payment for every core came at a high price to support a full-text search. After migrating on RDS paid with a full-text search of Hybris, he considerably reduced the overhead costs, and his catalog management became much easier. The benefits of the OOTB approach are evident. So you have to call on an experienced Hybris development company like Aimprosoft and get your B2B online store done. In the white paper by Intershop about digitalization in the wholesale industry business analytical tools are on the list of the essential features of the successful B2B e-Commerce platform. Indeed, you can’t measure and increase the profitability of your wholesale company without them. The real-time reports, standard analytics, and dashboards are presented in all components of SAP Hybris service. For example, in SAP Hybris Sales Cloud you can find sales marketing functionality. It is responsible for creating and executing campaigns and subsequently measuring their performance by means of standard delivered reports and analytics. Lead management functionality provides analytical tools for measuring the quality of leads and improving their conversion ratio. Are you ready to be a disruptor? In highly competitive environment wholesalers are forced to become the disruptors in their industry only to avoid being disrupted by other commercial giants. SAP distribution solutions help the wholesalers to achieve their desired objectives. The main features of this customer engagement and commerce suit will bring the agility required for your company to become the leader in your area. You must be interested in the cost of the state-of-the-art wholesale platform. Get a rough estimate for your upcoming project right now. We're ready to give you a professional advice and free cost estimate.